In a Sunshine Daze Supergoop! 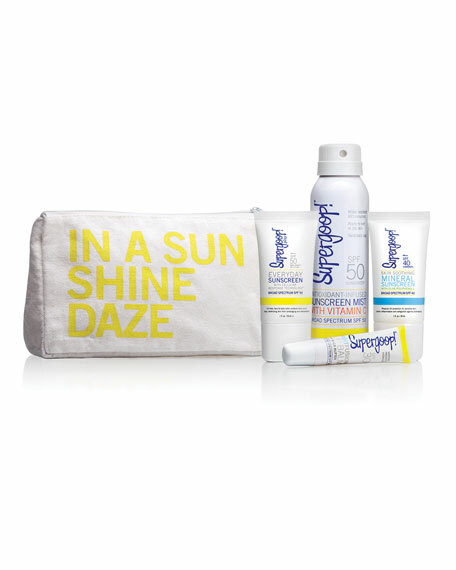 tote with conveniently sized suncare goodies offers UV protection for a day on the court, course, sea or sand. Everyday Sunscreen SPF 50 (1 fl. oz. / 30 mL): Oil-free face & body lotion protects from sun's rays, and is water resistant so it's ideal for a day of play. Skin Soothing Mineral Sunscreen SPF 40 (1 fl. oz. / 30 mL): This lightweight, physical UV protector easily applies to skin without leaving a white veil or residue, and is great for sensitive skin! Antioxidant Sunscreen Mist with Vitamin C SPF 50 (3 fl. oz. / 88.7 mL): Prefer a mist? Ours is a patent-pending, non-aerosol mist that contains less alcohol and no chemical propellants. Sprays from any angle for easy-peasy application! MintFusion Lip Balm SPF 30 (0.5 fl. oz. / 147.9 mL): Protects against UV-induced photoaging while soothing dry, chapped lips. Great over or under your favorite lip color! Zippered In a Sunshine Daze Travel Tote ($10 value): Keep your travel-sized suncare handy on the go. Supergoop! is the first protective skincare brand that puts SPF at the forefront. We're on a mission to change the way the world thinks about sunscreen through our clean, feel-good, highly innovative formulas that are fun and easy to use daily-not to mention superpowered to shield your skin from the full spectrum of light and other aggressors (think blue light, pollution and more). To make wearing it easier than ever, we infuse SPF into your favorite beauty essentials that have traditionally never been made with your skin's health in mind. Our products are all about healthy, glowing skin for all skin tones, types and ages. We care for your skin today and protect it for tomorrow. For in-store inquiries, use sku #1803501.